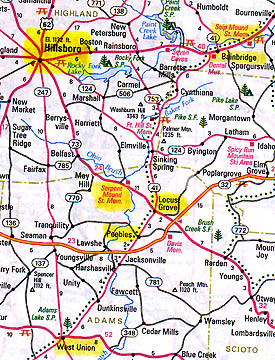 Hillsboro, Ohio is near the Hopewell ancient mound region where in 2003, there were several complex crop formations in soybeans noted by yellow in the above map. 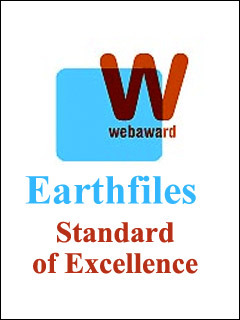 See 09-06-03 Earthfiles. 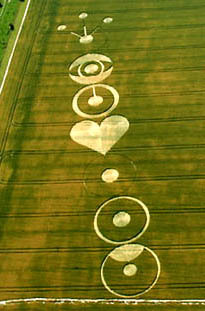 September 4, 2004 Cincinnati, Ohio – So far in 2004, there have been 17 crop formations reported in the United States ­ beginning on May 26th with a 7-fold (wagon wheel) geometric wheat pattern in Peach Orchard, Arkansas (See 06-02-04 Earthfiles); followed on June 17, by another large geometric pattern near Cordelia, California in Solano County, also in wheat (See 07-02-04 Earthfiles). 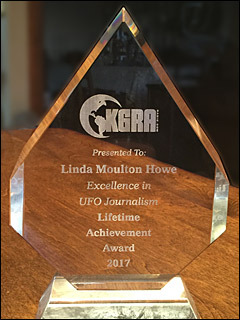 Then twelve days later on June 29, in a Spanish Fork, Utah, barley field, came a ring with appendages that changed over time and was associated with mysterious lights. See 07-06-04 Earthfiles. More barley was affected on Independence Day, July 4, when plants were laid down seemingly randomly in a Litchfield, Meeker County, Minnesota, field ­ except there were at least four layers of 90-degree angles in several places. See 07-26-04 Earthfiles. The day before, on July 3 in Eagle Grove, Iowa, a dozen random patterns of downed oat plants were reported. See 07-06-04 Earthfiles. 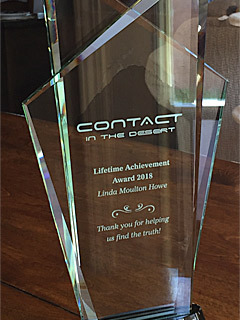 Then, on July 5th, in Hillsboro, OHIO, residents who requested anonymity – sent an e-mail to Jeffrey Wilson, Director of the Independent Crop Circle Researchers Association (ICCRA), along with a photograph of a rectangular section of corn that had been laid down with stems all going in one direction. The e-mail said in part: “We have what most would refer to as a ‘crop circle’ in our garden plot of corn. We have contacted the local sheriff’s department and he said it did not look like vandalism to him, but rather some type of natural or unexplained phenomena.” See 07-15-04 Earthfiles. After Hillsboro, crop patterns were reported in Chuckey, Tennessee grass on July 11; New Milford, Connecticut corn on July 14 See 07-15-04 Earthfiles. ; Tilden, Wisconsin oats on July 19 See 07-26-04 Earthfiles. ; Cottage Grove, Minnesota wheat on July 24; Spring Hill, Tennessee corn on Aug. 6; Charles City, Iowa grass on Aug. 8; West Union, Adams County, Ohio soybeans on Aug. 16, which some say is a hoax, but biophysicist W. C. Levengood found soil anomalies similar to Hillsboro, Ohio corn pattern. Above: West Union, Ohio, soybean field imprinted with a pattern of downed crop reported on August 16, 2004. Aerial photograph © 2004 by Jeffrey Wilson, ICCRA. Below: The Ohio pattern resembles the “crown chakra” in the formation reported at the Pewsey White Horse in Wiltshire, England, on July 22, 2004. Aerial photograph © 2004 by Francine Blake. Others were reported near Branson, Missouri in corn on Aug. 16; Lawton, Michigan corn on Aug. 23; and Wausau, Wisconsin barley. In Wausau, six circles appeared in a barley field around August 19-20, 2004 ­ the same time that several people reported UFOs and unexplained power outages from Minneapolis to Antigo. Farmer Scott Worden told Wausau’s Channel 9 WAOW-TV, “Never seen nothing like this in the field, You can see they’re all in a counter-clockwise motion the way the grain is wrapped. Something came down on the field, ya know, and it was turning in a counter-clockwise motion.” Two of the circles were about 20 feet in diameter and the other four were smaller sizes. On September 1, 2004, a farmer in Miamisburg, Ohio, reported an amazing pattern in his 8-foot-high corn, which Jeffrey Wilson and his ICCRA research team have investigated this week. Jeff said, “It is by far the most impressive lay of any corn circle formation that I’ve ever been to – not just from the sheer size of it, but the way the corn is laid down in curves.” See 09-03-04 Earthfiles. Recently the ICCRA team also studied the crop formation reported August 23, 2004, in Lawton, Michigan, in which a 32-foot-diameter circle in corn was put down along with a 10 x 12 foot rectangle appendage. Lawton, Michigan circle and rectangle pictogram reported August 23, 2004. 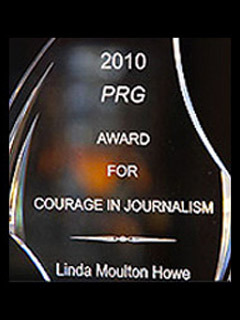 Photograph © 2004 by ICCRA. All the plants in the pictogram were laid down the same direction, similar to the Hillsboro, Ohio corn rectangle found on July 5th. 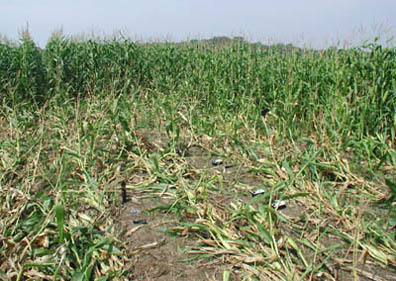 Corn laid down same direction in rows in circle and rectangle pattern reported August 23, 2004, in Lawton, Michigan. Photograph © 2004 by ICCRA. Jeffrey Wilson, Director, Independent Crop Circle Researchers Association (ICCRA), Cincinnati, Ohio: “There were quite a number of plants that they found a vertical rupture on some of the growth nodes. All of those were on the side of the plants that were facing the ground. But they are different than what has been seen in the past as expulsion cavities. This is something different and we’re not sure because it hasn’t been reported by anyone before about exactly what we’re looking at. SO, THIS IS AT LEAST AN UNEXPLAINED ANOMALY AT THIS POINT? WHAT WAS THE CONSENSUS OF SUGDEN, LIETZAU AND ROBERTSON BASED ON THEIR PAST EXPERIENCES OF HAVING BEEN THERE ­ WHAT WAS THEIR SENSE OF THIS CORN PATTERN IN RELATIONSHIP TO THOSE THAT HAVE BEEN MANMADE VERSUS THOSE THAT SEEM TO BE AUTHENTICALLY STRANGE? They really came to the conclusion that it was inconclusive. But just the more they looked, the more they found no evidence one way or the other. Although both Ted and Roger both describe the way that it looked as being very similar to Hillsboro ­ the two were very closely similar. Mysteriously downed corn plants in Hillsboro, Ohio garden, discovered on July 5, 2004. Hillsboro is near the ancient Hopewell earth mounds. 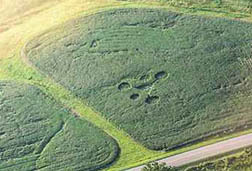 In 2003, the ancient mounds were the site of complex crop formations in soybeans. 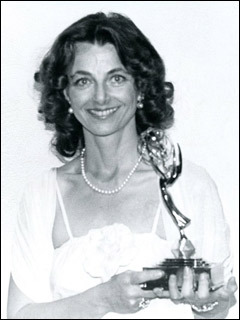 Photograph © 2004 by owners who request anonymity. It turns out that the Hillsboro corn has the largest number of scientifically documented anomalies of any crop formation this year in the United States. 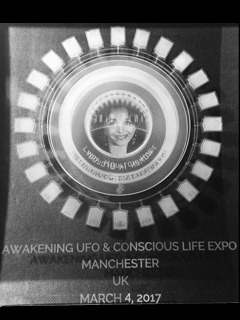 In as many of these cases as possible, Jeffrey Wilson and his volunteer colleagues in their Independent Crop Circle Researchers Association, try to investigate the plants, soil, magnetic fields, radioactivity and other physical evidence that can be studied by scientists. LET’S GO TO HILLSBORO BECAUSE I HAVE TALKED WITH W. C. LEVENGOOD AND RECEIVED PHOTOGRAPHS FROM HIM ABOUT THE MAGNETIC PARTICLE ANALYSIS IN HILLSBORO. IN THE PHOTOGRAPHS, THERE IS A CENTRAL CORE OF NON-MAGNETIC HEMATITE WHICH IS AN ORANGISH-RED SURROUNDED BY A CRUST OF MAGNETITE. HE’S NEVER SEEN IT QUITE LIKE THAT BEFORE AND I KNOW YOU WENT TO THE LAB TO LOOK AT THOSE PARTICLES. Yes, this is something that has not been seen or reported before in any other formations. We started to check some of the soil literature to see if anybody that is a soil scientist had really studied it, but we haven’t come across anyone who has reported anything like that either. So, this is some discovery of something new that people haven’t seen before. What is amazing to certainly Levengood, who seems to be very impressed by it, is that there is this fusion of magnetite right to the hematite core. To be able to do that ­ both magnetite and hematite are different varieties of iron and iron melts at a pretty high rate ­ higher than your oven does. So, there had to have been some high heat at some point to have this process affected that way. Why there seems to be a silica shell, however tenuous it is on the outside of this. How that can be fused to the two irons as well is a mystery without setting the crop field on fire or something. IT’S SILICA AND MAGNETITE IN THE CRUST AROUND THE NON-MAGNETIC HEMATITE. Yes, which is why I said when they pulled the magnetic particles out of the soil through that process of suspending the soil sample in a solution and then running a magnet through it to collect all those magnetic particles, that’s why this non-metallic hematite with the silica was in with all the magnetic particles because the magnetite was fused to it. AND THAT’S THE PUZZLE ­ HOW DID IT BECOME FUSED WITHOUT HIGH TEMPERATURE AND WHAT WOULD BE THE MECHANISM TO HAVE PRODUCED THESE KINDS OF PARTICLES? W. C. Levengood, Biophysicist, Pinelandia Biophysical Laboratory, Grass Lake, Michigan: “Those crop formations where I’ve been able to obtain soil samples ­ probably number around 100 now around the world. In about 99% of the cases, these were very spherical, tiny and ranging from 5 microns up to 100 microns, about 1/10th of a millimeter or a little bigger. They have always been shiny black particles and those few EDS (Energy Dispersive Spectroscopy) that I’ve had people do for me show that they are pure magnetite. Those in themselves are anomalous for several reasons. First of all, they probably did not come from the far reaches of outer space, but they were transformed into pure magnetite with no nickel whatsoever. Ordinarily the iron meteorites that we know about always have a percentage of nickel. These have none. So, this indicates the model and John Burke and I published in the Journal of Scientific Exploration to describe the process of formation for these magnetite particles are probably correct. (A spinning plasma vortex with microwave and other energy components that comes down from high in the atmosphere through iron-rich meteoritic dust that is sprayed on plants and soil in crop formations.) The nickel might have been separated out by the ion plasma vortex. What I found in the Hillsboro formation are hematite silica particles ­ many of them broken open, which in itself is extremely unusual. I don’t think I’ve ever seen a magnetite particle broken open. Instead of pure magnetite, they were filled with mostly very fine particles of hematite ­ that’s one of the non-magnetic forms of iron. The common term for it is ordinary rust, oxidized iron. But it was very uniform, except for very tiny 1-2 micron range shiny black beads of magnetite. Left: Reddish non-magnetic hematite core of broken open “egg-like” particle. 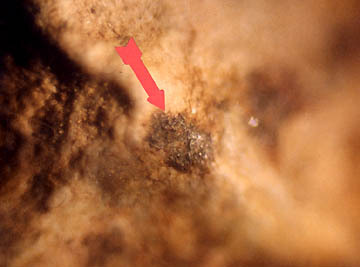 Right: Unbroken egg-like particle with silica dioxide and magnetite crust. 100X photomicrograph © 2004 by W. C. Levengood. This is a typical split sphere, but this is a whole new dimension of anomalies here. The thing that makes it so anomalous is that each of these split-open-spheres (and some that are not split) are filled with hematite (red-orange), the non-magnetic form of iron oxide. I’ve never seen this before. This is 100 x magnification and you can see the graininess in the hematite. That’s the red material and that half particle right in the middle. It’s not pure hematite. There’s also some magnetite mixed in or I wouldn’t have been able to pick it up with a magnet. WHAT ABOUT THE SURROUNDING GRAINS? There is one to the immediate right that’s not broken open, but it’s out of focus. At this magnification, it’s very difficult to keep everything in focus. So on the immediate left is a grain, but it shows the part that IS in focus which is the edge. It shows a coating which I will discuss in a little bit more detail in a minute. SO, THE DOMINANT THING IS THAT WE HAVE A BROKEN PIECE THAT IS THE RED PART IN THE CENTER AND THAT IS THE HEMATITE WITH A LITTLE MAGNETITE AND TO THE RIGHT IS ONE OF WHAT YOU CALL A KIND OF EGG IN WHICH IT’S NOT BROKEN. IT HAS HEMATITE IN THE CENTER AND IS SURROUNDED BY A CRUST OF MAGNETITE AND SILICA. Yes, and in the photomicrograph below, I’ve gone from high magnification to low and you can see the same two particles amid others. You can see the red hematite sort inside a very thin shell. I call this the ‘egg shell’ effect because the hematite is inside sand grains (SiO2 silica dioxide) that are fused with magnetite. That’s why the particles can be picked up in a magnet drag at the crop formation. Wider view of the broken open hematite, magnetite and silica “egg.” Filament is piece of cotton thread. 40X photomicrograph © 2004 by W. C. Levengood. The coating of very fine silica grains mixed with, or fused with, magnetite gives the particle sort of a whitish shell with the brilliant red interior of hematite, non-magnetite iron oxide. 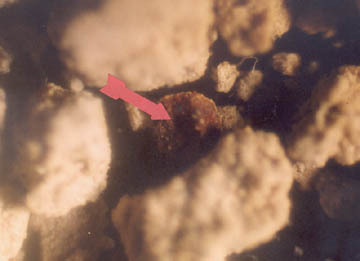 Whitish reflective silica dioxide (Si02) and magnetite crust surrounding red “yoke” of non-magnetic hematite. 100X photomicrograph © 2004 by W. C. Levengood. 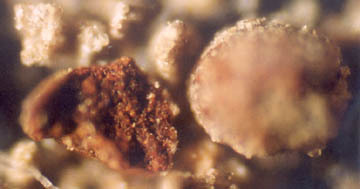 In the photomicrograph above, you can clearly see that egg shell effect. In the middle, is the red hematite spilled out of the ‘egg,’ and just above that you can see the whitish egg shell reflecting quartz grains. THE QUARTZ IS THE SILICA. YOU’VE NEVER SEEN THAT BEFORE? I’ve never seen that before. In other crop formation investigations, we have found many tiny spherical particles of pure magnetite in the soil, but not these egg-like combinations containing the two types of iron. ANY GEOLOGICAL LITERATURE ABOUT THIS? DO YOU HAVE ANY HYPOTHESIS ABOUT HOW THIS WAS CREATED? No, because you see it couldn’t have been created after the things fell to Earth, because it’s so uniform. There are no stains in the soil, which there would be ordinarily. In other words, how ever this was formed, it formed before the particles reached the surface (of the Earth). FALLING DOWN THROUGH THE ATMOSPHERE. COMPARED TO THE AMOUNT OF MAGNETITE YOU HAVE FOUND IN SOILS IN ISRAEL, ENGLAND AND THE UNITED STATES INSIDE OF CROP FORMATIONS, WHAT IS THE CONCENTRATION IN THIS HILLSBORO PATTERN? It’s interesting with the magnetic drag, I either find a significant amount ­ and by that I mean an amount quite well above the upper limit for ordinary soil which is 0.4 milligrams per gram of soil. These ran around 6 to 5 to 2 ­ in other words, roughly over 10 times the upper limit for normal soil. That, however, is not nearly as high as I’ve found before (as much as 750 times concentration), but it’s enough to keep you going ­ particularly when you find that the controls which were taken some distance from the Hillsboro pattern ­ they were down to the normal level around .4 milligrams of magnetite in each gram of soil, or less. 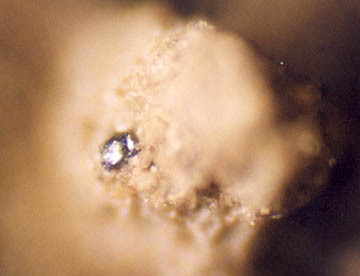 Shiny magnetite particle embedded in Hillsboro, Ohio, corn formation soil gathered at the site by the ICCRA research team for analysis by biophysicist W. C. Levengood. 100X photomicrograph © 2004 by W. C. Levengood. In the photomicrograph above, there’s a small magnetite particle. Its shiny appearance is embedded right in the grain. This is typical of what we are finding in most crop formations where there are any magnetic particles at all ­ except in this case of Hillsboro, Ohio, the hematite seems to dominate and there is much less magnetite. 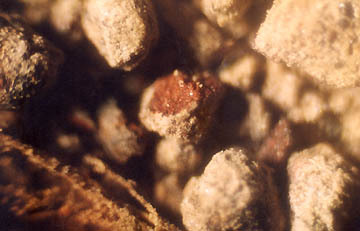 Wider view of very tiny magnetite particles in the Hillsboro, Ohio, corn formation soil. 40X photomicrograph © 2004 by W. C. Levengood. WHEN YOU LOOK AT WHERE THE SOIL SAMPLES CAME FROM IN WHAT SEEMED RANDOMLY DOWNED CORN, DID YOU FIND ANY UNUSUAL PATTERN IN THE DISTRIBUTION OF THE SMALL PARTICLES THAT HAD BOTH HEMATITE AND MAGNETITE IN THEM? Not really. No, you see the circular motion, the rotational motion, angular velocity of these plasma vortices, are such that for the magnetic material that is caught up in them, they just throw if all over the place. The only pattern I’ve ever found is in distance from the formation, as if centrifugal force were involved. 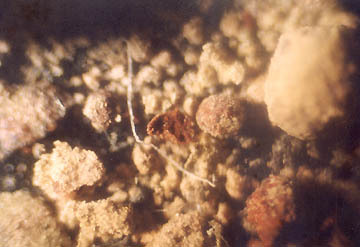 Another example of a hematite, magnetite and silica “egg” particle in the Hillsboro, Ohio, corn formation soil. 40X photomicrograph © 2004 by W. C. Levengood. This was such a new discovery and so amazing. This again is a hematite sphere, or ‘egg’ that has broken open In this one, there are little magnetite grains, shiny black particles, in the right side of the red hematite. It’s all mixed in together and this also shows the white ‘egg shell’ effect very nicely. This has a little thicker shell than some of the others. They aren’t all exactly uniform. 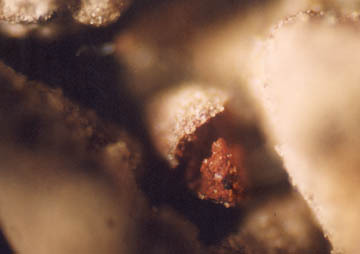 One of several tiny holes found in the middle of the “eggs.” 40X photomicrograph © 2004 by W. C. Levengood. This is again a large irregular particle covered with the magnetite. You can see it stuck to the sand grains. What that hole is in the middle, I don’t know. This might have been escaped gas or might have been punched in there. It’s hard to say. WHAT IS THE ARGUMENT FOR PEOPLE WHO SAY THIS IS JUST SOME NATURAL PHENOMENON IN THE SOIL? 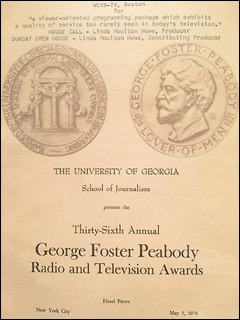 Because about two years ago, there were two papers in Nature and both of them had micrometeorite particles, spherical particles, on the cover. One thing that was emphasized in both of those papers was how rare these particles are. These were found down at the bottom of a well in Antarctica about 80 feet underground. I don’t know exactly how they found the particles, but in the well they found these 20 or 30 magnetite particles. 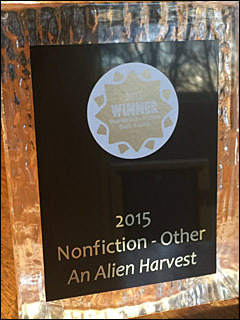 My God, in crop formations, I find that many in one magnetic drag, or more ­ hundreds! In the normal soil, they are very rare. STATISTICALLY, YOU HAVE FOUND SO MUCH MORE OF THIS MAGNETITE AND HEMATITE INSIDE OF CROP FORMATIONS THAN SHOULD BE IN NORMAL SOIL? Hundreds of times more, yeah. AND HERE WE HAVE IT IN HILLSBORO, OHIO, IN WHAT TO THE EYE WOULD APPEAR TO BE RANDOMLY DOWNED CORN. This was hit by the energies. RIGHT, BUT IT FALLS INTO THAT CATEGORY YOU STUDIED IN BLUE BALL, MARYLAND, IN CROPS IN WHICH THERE IS NO GEOMETRIC PATTERN. 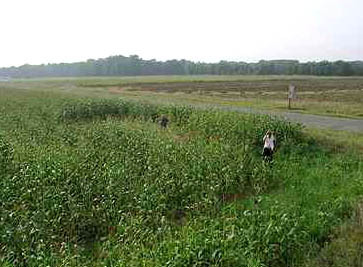 West Union, Ohio, soybean field imprinted with a pattern of downed crop reported on August 16, 2004. Aerial photograph © 2004 by Jeffrey Wilson, ICCRA. 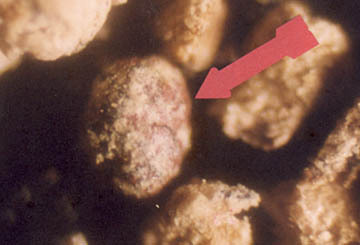 Same hematite, magnetite, silica dioxide “eggs” also discovered in soil sampled from the West Union, Ohio, soybean formation reported on August 16, 2004. 40X photomicrograph © 2004 by W. C. Levengood. THAT’S REMARKABLE BECAUSE JEFF AND EVERYONE THINKS THAT WAS HOAXED. Previous PostPrevious Updated Photos: Big, Impressive New Corn Formation in Miamisburg, Ohio.